Surcompany.com - Your source to everything German WWII. Top quality SS Tunics, Helmets, Visors, Breeches & much more! REPRODUCTION. Double side printed (except for the Splinter camo) - Summer green/Fall brown. Fully reversible. These simple looking jackets are made of almost 60 pieces of hard wearing cotton fabric. Vented armpits, oxidized steel buttons, Foliage loops, Cotton thread. Threaded eyelets… and much more. Deep cargo pockets are secured by pleated pocket flaps and steel buttons. Manufactured with sturdy canvas material. 100% cotton. State of art sewing job per German regulations. Not an original item. 100% authentic reproductions. Made in USA. Smocks are over sized so that you can wear them over a wool tunic. 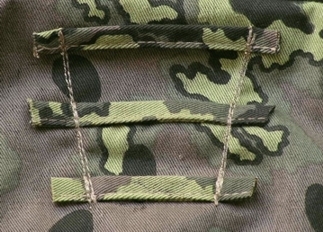 M42 Heer splinter camo smock. Fully reversible to white for winter use. Vented armpits (see the picture). This simple looking jacket is made of over 60 pieces of hard wearing cotton fabric. Oxidized steel pebble buttons are used for pocket flaps. Threaded eyelets for the strings. Model 1942 Waffen-SS Blurred edge camo smock. Fully reversible: Summer green to Orange Brown. Vented armpits (see the picture). Model 1942 Waffen-SS Burred edge camo smock. Fully reversible: Fall Brown to Summer green. Vented armpits (see the picture). Model 1942 Waffen-SS Oak camo smock. Fully reversible: Vented armpits (see the picture). Widely used by German during the Battle of Bulge and Russian front. Made of medium weight white cotton fabric. Not an original item. Reproduction. Never used. Made by a professional tailor. Great details, excellent sewing work. Reversible design. Copyright © Surcompany. All rights reserved.